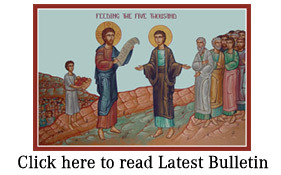 PDF of St Athanasius bulletin 10.5.15 SUNDAY OF THE MAN BORN BLIND has interesting articles (A Mother Dies many Deaths; Bishop Petro Oros; Bishop Basil Hopko; The Holy Martyrs Vitus, Modestus, and Crescentia; Feast of the Holy Ascension) and many announcements in addition to the liturgical schedule. SUNDAY OF THE MAN BORN BLIND. MON. MAY 11 Our Holy Father & Confessor Basil [Hopko], Bishop of Midila. The Holy Priest-Martyr Mocius. Our Holy Fathers Cyril & Methodius, Apostles of the Slavs. The Foundation of Constantinople [330 AD]. TUE. MAY 12 Our Holy Fathers Epiphanius, Bishop of Cyprus and Germanus, Patriarch of Constantinople. WED. MAY 13 Leave-Taking of Pascha. The Holy Martyr Glyceria. FRI. MAY 15 Post-Festive day of the Ascension. Our Ven. Fr. Pachomius the Great. Our Ven. Fr. Isaiah the Wonder-worker, Bishop of Rostov. SAT. MAY 16 Post-Festive day of the Ascension. Our Ven. Fr. Theodore the Consecrated, disciple of St. Pachomius. The Holy Martyrs Vitus, Modestus & Crescentia. The Passing of the Blessed Priest and New Martyr Vladimir Bajrak at the Drohbych Prison . SUN. MAY 17 SUNDAY OF THE FATHERS OF THE FIRST NICEAN COUNCIL. Post-Festive day of the Ascension. The Holy Apostle Andronicus and His Companions. The Passing of the Holy Priest – New Martyr Ivan Ziatyk .